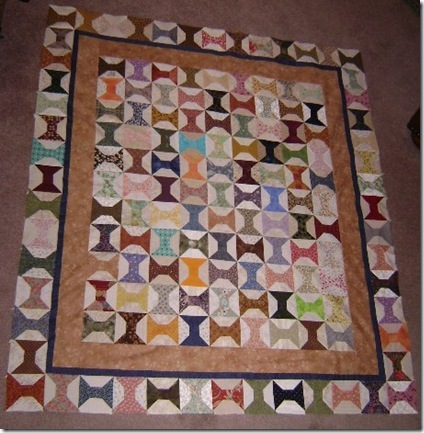 Spools Quilt is Almost Finished! Just one more narrow blue border… and it will be finished! …at least I think so. I’m still debating whether or not to include some appliqued words around the tan border. I don’t know whether it will look good or not. What do you think? Just leave it as is? Or words? Many of my regular readers might remember me having surgery back in October of 2010. I’m SO THRILLED with the difference it has made in how I look and how I feel. Five months later, I’m working out regularly at the gym and walking on the treadmill at home. I’m so much more active that I was this time last year. Actually, this time last year if I walked for 5 minutes I was winded and had to sit down. Now I can easily walk for an hour at a good pace. Here’s what an 82 pound loss looks like! Yes, I know, my clothes look too big for me. They are! When I buy a pair of pants, they fit for about 2 weeks, and then they are baggy. But that’s a GOOD thing! On Friday, I pick up my father at the airport. He hasn’t seen me since November 1st, and I know he’ll be so impressed with the difference. Can’t wait to see the look on his face! Special thanks to The Woodworker for taking my picture every month on my surgery-versary date! Wow how did you do it? You look wonderful. I'm so glad this worked for you and you are feeling so well. Your Dad will be happy at how healthy you have become. Great going on all fronts! Nothing suceeds like success! Your quilt is so pretty – I vote for words, I love words on quilts! Caron, you look AMAZING – I'm so happy for you, congratulations!! Caron – Congratulations. You look wonderful. Glad you are feeling better than a year ago. You're looking terrific! I like your spools quilt the way it is, though words might be nice too. I'm sure you'll make the right decision. I vote for words because I am really liking wordy quilts lately. I am considering putting some on the wonky house quilt I am working on now.